Kurlee Belle: Work It Out! 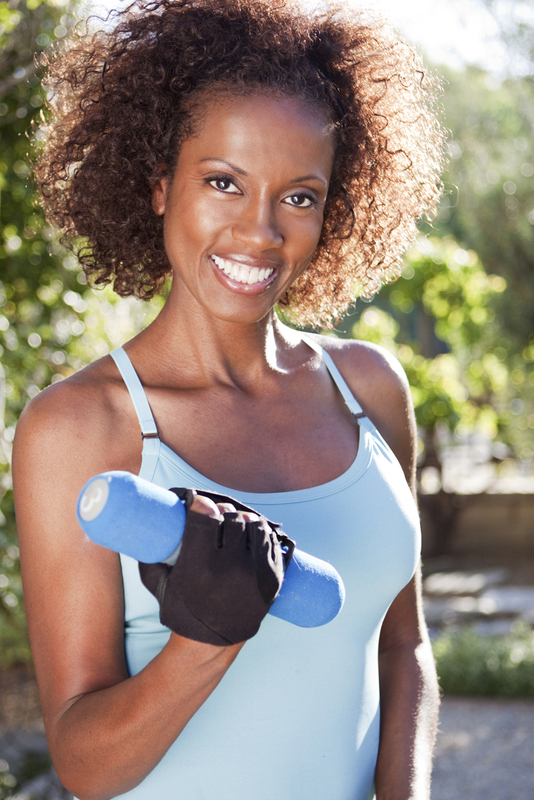 One of the benefits of being natural is exercising without having to sweat out your hair. Before I was natural, the biggest deterrent to working out was sweating out my wrap. Exercise and a wrap do not go hand in hand. I remember hitting the gym on my lunch hour. At the time, I worked for a company that allowed employees to hit the gym for an hour and a half during the work day. My colleagues and work-out partners were 'non black' and did not have the same struggles as I did when it came to exercising and hair. I would watch my friend, swoop her hair back in a ponytail and hit the treadmill. It only took her 5 minutes to change from work clothes to workout gear. I on the other hand always needed about 15 minutes pre workout and 35 minutes post workout to get dressed. I travelled with my Velcro mesh wrap and before changing into my workout gear, I would brush my hair in a circular motion and apply the wrap. Needless to say, I felt a little self conscious walking into the gym area looking less than 'done up'. I would get a couple of stares from 'non black' males and females that did not understand what I was wearing on my head but after a few days I got over it. The post workout process was even longer, because I had to travel with a shower cap to avoid the water touching my precious strands. In addition, I travelled with my flat iron, to smooth out the bumps as a result of my mesh wrap and the tight curls that formed on my hairline from sweat. Today, my gym bag is a little lighter (minus Velcro mesh wrap, flat iron and wide tooth comb) and I feel confident when I workout because I still look cute. Unlike, the days when I had straight hair and had to be self conscious of the way I looked with a cap on my head. I can workout with the same style I had when I walked in the gym's door. My natural hair does not dictate what I can and cannot do. It allows me to enjoy life's activities without restrictions. I can workout and still look cute, swim in the ocean or pool and not have a major hair-attack/heart-attack and forget my umbrella on rainy days. According to the U.S. Department of Health and Human Services, Office of Minority Health, in 2010, black women were 70 percent more likely to be obese than white women, and that number only grows for adolescents of our ethncity. From 2007-2010, black girls were 80 percent more likely to be obese than white girls. Furthermore, four out of five black women are overweight or obese, and African Americans were 70 percent less likely to exercise than white people in 2010. That ISH CRAY!!!! Water should no longer be a dreaded substance. Get up and work it out! Has natural hair made activities like exercising and swimming more enjoyable? I will be big chopping in a little over 2 weeks, and having the ability to work out and not have my hair completely ruined is one of the things I'm most looking forward to!! Thanks for your comment. You will feel like a brand new woman after you BC. Natural hair allows you to enjoy life without worrying about your hair! So liberating.